Avaril Oral is a new TV serial on malayalam entertainment channel Surya TV. 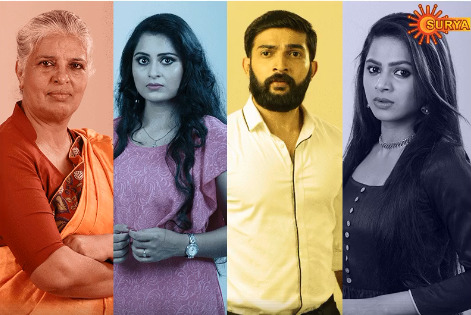 The new family drama was launched on 18th December 2017 at 8:00 PM. Avaril Oral will be aired every Monday to Saturday at 8:00 PM only on Surya TV. Avaril Oral is the first serial from Listin stephen’s magic frames, a production house know for super hit malayalam movies in their credit. Avaril Oraal is directed by Jayaraj Vijay with a script written by famous duo Bobby and Sanjay. Avaril Oraal Serial Serial Story : As per promos Avaril oral is a family thriller drama. The story of Avaril oral revolves around Subhadhramma who is a very successful business women and grandmother to Nandita. Nandita lives with her best friend Ishita in Bangalore but is forced to come back to Kerala to take charge of the loss-making business of her grandmother and Geetanjali moves in with Ishita. Nandita meets Mohan and falls in love with him but her grand mother disapproves of their relationship due to which she is forced to walk out of the business to marry Mohan. What happens next ? Avaril Oral serial Online : All episodes of Surya TV Serials can be watched through new Sun Net work Application SUN NXT .